All out of diapers, the diapers are all in the wash - or you left the diaper bag at home or in the car?? And your baby needs to be changed, RIGHT NOW!? Why not use your cotton T-shirt! 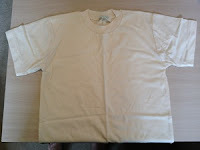 Any size T-shirt will do, but the bigger the T-shirt, the bigger the baby it will fit - and the better the absorbency. I used a child's size large organic t-shirt for my pictures. Fold over one side to the middle. 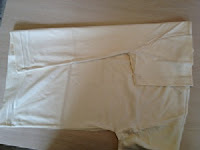 Repeat with the other side, to form a tapered end (cross over each side in the middle) at the T-shirt hem. 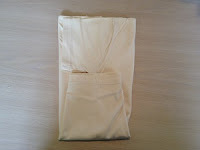 If the sleeve end is not wide enough to go around your baby's waist, simply widen your fold more. Fold up the t-shirt hem to about half-way, to fit your baby. Place baby's bottom on the center of the T-shirt. Bring folded end up between baby's legs. Wrap the sides around baby's tummy. Use cloth diaper pins or a Snappi® to fasten diaper securely. Or simply place inside a Velcro® or snap diaper wrap. 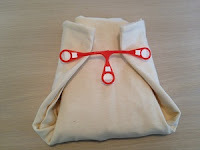 • Origami Fold a T-shirt into a Diaper - No Sew!